Author Snow, Ted D., author. 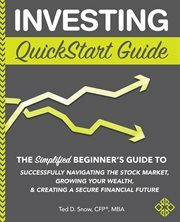 Title Investing quickstart guide : the simplified beginner's guide to successfully navigating the stock market, growing your wealth, & creating a secure financial future [Hoopla electronic resource] / Ted D. Snow, CFP, MBA. Publication Info. [United States] : ClydeBank Media LLC, 2018. Summary The Ultimate Beginner's Guide to Investing in the Stock Market. The ONLY investing book that is written by a CFPʼ practitioner with 30+ years of investment experience helping others to invest wisely to achieve all of their financial goals in life. If you are looking for the best investing primer on the market today, then consider your discovery of this book the first big event in a hot streak of good financial fortune! The Investing QuickStart Guide offers a simplified but expansive introduction to the world of investing. Author, Ted D. Snow, CFPʼ, MBA brings 30-years of experience in the finance industry to bear, much to the benefit of novice learners and experienced investors alike. Snow provides readers with the complete picture on stocks, bonds, treasuries, ETFs, mutual funds, indexes, REITS and several other investment securities. Snow's intrepid but practical asset-allocation investment philosophy is marvelously communicated and highly appropriate for market newcomers. Meanwhile, readers of all experience levels will surely appreciate Snow's unique ability to simplify and clearly articulate a wide spectrum of actionable investment wisdom. The key insights of Warren Buffet, Peter Lynch, Burton Malkiel, and James Altucher all play important roles in this seminal investment resource. But unlike with most of today's books on investment, the Investing QuickStart Guide threads the needle between thorough and simple. You will learn the market from end-to end, while also enjoying Snow's fascinating personal stories and insights from the front lines of the finance industry. If you are interested in learning about the stock market but uncertain of where or how to begin, then this book could prove to be your ticket into the club and may very well have an enduring positive effect on your financial future. Ted D. Snow, CFPʼ, has a knack for making complex ideas clear while endowing his readers with a wealth of powerful new knowledge. Whether you are a newcomer to investing or a veteran looking for a fresh perspective, you will enjoy the unique and practical vision for investing success offered in the Investing QuickStart Guide. You'll Learn: Everything You Need to Know Before You Make Your First Trade. How To Take Advantage Of Opportunities In The Market Without Relying On Guesswork. How to Evaluate and Compare Stocks and Other Securities. How Disciplined Approaches to Investing Can Lead to Early Retirement and Financial Freedom. How National And Global Economic And Geopolitical Factors Can Influence Investment Prospects. This book has been reviewed by The Financial Industry Regulatory Authority (FINRA). FINRA's mission is to safeguard the investing public against fraud and bad practices. **INVESTING DIGITAL ASSETS: Each purchase includes access to the Clyde. Bank Media Investing Digital Asset Vault which contains tons of online resources to help you become a better investor such as workbooks, cheat sheets, reference guides, chapter summaries and more!